Trisomy On-Line - What is the Angel Wings List? 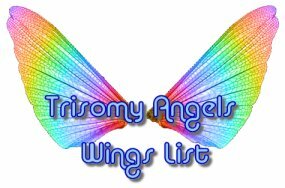 The Trisomy Angel Wings List (Wings for short) is an email based support group for parents, relatives and friends of our trisomy Angels - our little ones who could not stay here on this earth with us, but who we will forever keep in our hearts. It is a place where we can share our pain, memories, love and heartache, with others who understand. Somewhere that we can celebrate birthdays, anniversaries and support each other when the hurt is great. Many of our members become close friends both on the internet and off. There is no need to spend hours on the internet at websites as the list operates by email. Members simply register their email address and then send an email to a central email address known as the "list address". That email is then sent to all the members of the list allowing them the opportunity to read or respond as they wish. The Wings List is "complimentary" to the Trisomy Medical list, and the they shall always be close twins in love and support. However the creation of the Wings List as an entity apart from the main medical list is acknowledgment of the fact that grief is complex and often cyclic. For most there comes a time when the grief we feel "needs" a place of its own, some time out from the harsh reality of life, before we have the strength to "rejoin" the rest of our 'family'. Please feel comfortable to move freely between any of the lists as your needs change. The Wings List is a "closed" list to help ensure that it is a safe environment for those who participate. A closed list simply means that you need to register the email address you wish to use before you can post a message to the list. We do not require ANY personal information or charge any fees to be a member. Your email address will only be known to other members of the list if and when you send a mail to the list and to the list administrators. Your email address is stripped from all stored messages to avoid spam or any invasion of your privacy. There are also no advertisements associated with the list and we will not sell or give your email address to any third party. Mandy is married to Barry and lives in the UK. Mandy understands the loss of Wings parents as she herself has lost two very special sons as the result of genetic conditions. Gareth in 1999 who was effected by Trisomy 18 and Dominic in 2000 who was effected by Cystic Hygroma. In addition Mandy is mum to Matthew, Charlotte and Alfie plus two special step children, Katie and Ed. Mandy's role is one of "mum" to the list. She ensures that everything runs smoothly on the list and that people understand the list rules. Mandy is also able to assist anyone with the technicalities of the list, for example if you have difficulty unsubscribing. If you have any problems, concerns or suggestions regarding the Wings List please do not hesitate to contact Mandy or alternatively Karen (the list owner). There are a number of ways that you can receive the lists messages. By far the most common way that people participate in the list is by subscribing to receive individual emails. That is, as list members send an email to the list a copy is sent directly to your inbox. With digest mail, the individual emails are kept and one or two emails (depending on the mail volume) are sent each day. With the digest mails a list of all the subject headers is included so that busy people can scan through the included mails to see if there is anything there of interest. If you do not wish to receive emails at all you can read list mails on the web by going to the archives at www.freelists.org However if you wish to post to the list, you will need to subscribe using your email address. However to continue NOT receiving emails place yourself on "vacation". This allows you to post to the list but not actually receive emails. If you have ANY difficulties with this please don't hesitate to contact Mandy who will happily help you. If you wish to subscribe to the list (and we hope that you do) please follow the link below. We look forward to welcoming you to the list and being a part of this very special community!